Both the Providence Warwick CVB and Discover Newport work hard to court new meetings, conventions and sporting events with the goal of bringing more bookings and visitors to our communities and our state. 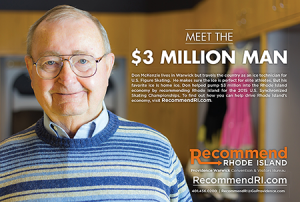 Since no one sells Rhode Island as effectively as the people who live here and love the state, “Recommend RI” is a dedicated ambassador program that gives every Rhode Islander the opportunity to take an active role in promoting the effort. Many of Rhode Island’s business and community leaders and residents are influential members of associations, corporate boards, social groups or sports organizations. Any Rhode Islander can be an ambassador actively recommending the state as a potential site for their organization’s next meeting, convention, conference or sporting event. Local leaders can help by encouraging their professional organizations to meet in Rhode Island. Recommend RI ads and testimonials exemplify the program, ranging from Governor Gina Raimondo, who brought the National Governors Association Summer Meeting to Providence in 2017, to General Treasurer Seth Magaziner, who is bringing the National Association of State Treasurers to our destination in 2019. Some other recent contributors include: Wendy Mackie, who brought in the Rhode Island Marine Trades Association; Barbara E. Wolf, PH.D., R.N., F.A.A.N., of the URI College of Nursing, who brought in the Eastern Nursing Research Society&apos;s 31st Annual Scientific Sessions; and Dinalyn Spears, with the Narragansett Indian Tribe, who brought in the Fish & Wildlife National Conference, Narragansett Indian Board Meeting. Working with Recommend RI ambassadors, the value of this effort in 2017 alone totaled nearly $10.4 million in economic impact for Rhode Island. When Rhode Islanders help us book business, everybody wins. Hotels are full, restaurants see an uptick in business volume, the airport is busy and retailers are happy. All this activity generates tax dollars for the state, and more importantly, generates jobs for Rhode Island residents. Click Here to Recommend Rhode Island.